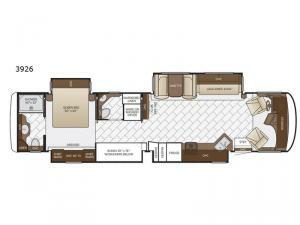 For additional space and comfort, choose this Canyon Star 3926 class A motor home. This Newmar model features quad slide outs with plenty of living space in the front of this model to visit with your family, watch TV, or just hang out. Your kids will enjoy their own space with the set of 30" x 76" bunk beds. Across from the bunks there is a convenient half bath and in the rear of this model you will find a full bathroom with a 40" x 32" shower.